Visit the Royal Opera House for the first time with reduced-price tickets for a much-loved work. Excitement is building ahead of the next Welcome performance for those who have never had the chance to see The Royal Ballet on stage before; The Royal Ballet's adaptation of Lewis Carroll's Alice's Adventures in Wonderland on 31 March. Welcome performances offer families that have never previously attended, the perfect introduction to The Royal Opera House. As well as tickets for as little as £5 (with a top price of just £20), all audience members are invited to arrive early to experience a variety of activities in the front of house areas. These include opportunities to don The Royal Ballet and Royal Opera's stunning costumes, meet the creative team and ask them questions, listening to a reading of Lewis Carroll's tale and trying out some of the orchestra's instruments. As well as these activities, a reasonably priced, family-friendly offering from our bars and restaurants is available. Please note that this ticket offer is only available to visitors who have never been to Royal Ballet performance. "I was over the moon to be able to take my children to see something I have wanted to be able to go to since I was a child, but never previously able to afford. 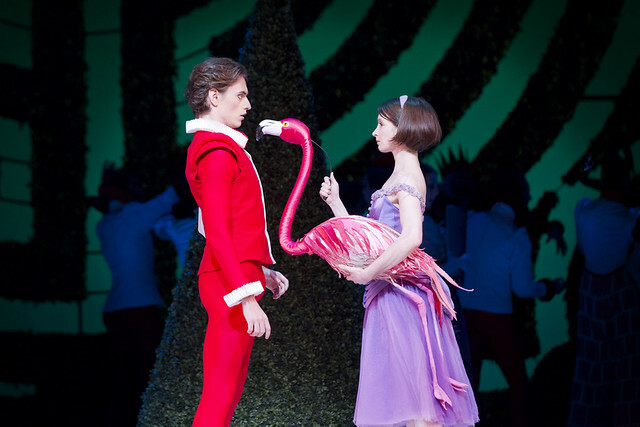 Thank you"
Choreographed by Christopher Wheeldon, Alice premiered to rave reviews last season. Funny, beautiful and enchanting, the ballet is perfect for all ages. As well as first rate dance, Joby Talbot's score magnificently evokes Alice's surreal journey, brought to life by principal dancer Lauren Cuthbertson. If you have children aged from six to 12 and have never been to a performance at the Royal Opera House, why not register your interest? My granddaughter Tabatha saw a snippet of Alice In Wonderland, danced by the Royal Ballet, whilst we were shopping in John Lewis. she was 4years old and mesmerised. we could not drag her away. She has started to ballet dance and has her 1st IDA exam in March. She loves ballet. I would love to get tickets to take her to see this production. We have never been to the ballet at the Royal Opera House before.